Today I’ve been reading up on Ayurveda in preparation for Panchakarma next week. Foreign words to you? They’re not exactly foreign to me in that I’ve been around related philosophies for many years, but I’ve never delved in to this extent before. I have a reference work in my library on Ayurveda by Vasant Lad, the Doctor of Ayurvedic Medicine who founded and runs The Ayurvedic Institute. Picking it up to browse, I run into astrology in the first chapter! According to a philosophical system which originated thousands of years ago in India called Sankhya, there are 24 principles of creation, sort of like 24 steps Divinity takes to become our day-to-day experience. And the very last five of these steps are Ether, Air, Fire, Water, and Earth. This is very close to Western Astrology. In astrology, Air, Fire, Water, and Earth are seen as the basic elements of our solar system and they form the bedrock of all of the astrological signs. I’m sure you’ve heard people say, oh, I’m a water sign, I’m very emotional. And it’s true, water signs do tend to focus their energy on the emotional space, on giving and receiving, on nurturing and nourishing. So Ayurveda has the same elements, with very similar meanings to how they are used in Western Astrology, except Ayurveda has an extra element, Ether. Ether is not unfamiliar in western philosophy. In Greek mythology, ether referred to the upper sky, space and heaven. The alchemists and early physicists also considered ether to be a substance which filled all space and transmitted impulses across space. 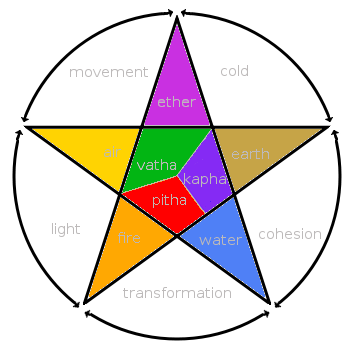 Present day Western astrologers generally regard ether similarly to Ayurveda, as a pure essence out of which the material world of air, fire, water, and earth come. Ayurveda maintains that the elements can get out of balance, causing problems in our mental, emotional, and physical health. Western astrology maintains the same idea. We are born with a certain balance as shown in our natal charts, certain proclivities to express ourselves in particular ways. As time goes on, we build on our original balance and we learn to fill-in or compensate for elements which are lacking. If we have an overabundance of a certain element, we learn over time to use it productively, to channel it well, and direct its flow. I’ll give you an example of compensating for a missing element. I was born with no planets in the Earth element. And yet, I have always drawn to me people with an abundance of Earth in their natal chart, especially Taurus. My sister is a Taurus; my partner of almost 30 years is a Taurus; my son is a Taurus; and often my closest friend is a Taurus. These Taurus people add good earthy values to my life: with them I eat regularly, the refrigerator is full, my house has furniture and appliances, I have clothing, a car, and a good rhythm and routine that I can use as a springboard for my many interests. On my own I tend to be constantly on the move, with too many things happening at once. With these steady, Eddies around me, my fire and air don’t have a chance to excite me into a whirlwind and then exhaustion. Do you know the balance of your elements? (If you don’t have your chart, use this link to go to my other blog and see the directions on the right to have me send one to you.) Here is a way to see the relative balances in your chart. Add up your chart points giving two points for having the Sun, Moon, or Ascendant in each of the elements below. Give one point for all the other planets: Mercury, Venus, Mars, Jupiter, Saturn, Uranus, Neptune, and Pluto. And add one point for the sign on the Midheaven (the cusp of the 10th house.) If you’re not sure which symbols are which, send me your birth data at ellen@astro4business. com and I’ll do the math. How did you do? If you’d like to leave your findings in the comments, I’ll reply with a few lines about your relative strengths. It may take me a few days though. 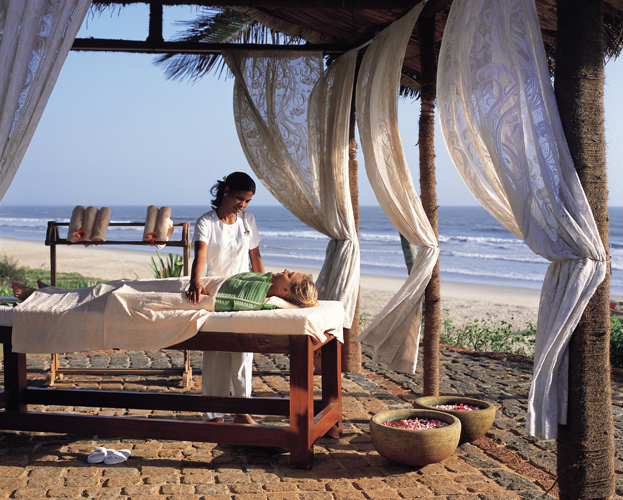 I’m heading for my week-long Panchakarma adventure in a couple of days. I’ll let you know how it goes, and what else I learn about astrology and the elements while I’m there. What you said waas actually very reasonable. or two to gget readers excited about everything’ve got to say. I’ve been online on-line greater than 3 hours these days, but I in no way located almost any intriguing write-up for instance your own property. It is really really worth sufficient for me. Privately, when just about all net entrepreneurs along with blog writers made very good content just like you have, the internet is actually a great deal more valuable than before. Nice Post..good information about balancing elements. hi Ellen…. again! Sorry I am totally overdoing it with the comments today. I shall try to resist commenting anymore today I promise!! Dear Tesa – never resist commenting. I love it! I say fire and water make STEAM!!! They are both full of energy and prone to highs and lows – like a “never a dull moment” type of person. You have to be sure to take care of your physical body because both these elements make high demands on it. You have a lovely chart – don’t be nervous. Very creative, very spiritual. Aw, Ellen, thanks. That almost made me cry! I am learning so much from your blogs, and it is so much fun!! I’m so thankful to have “met” you! Yes, I’m thankful too, Tesa. I hope you are loving and learning during your week retreat. I am trying to become chart-reading-savvy, but am not having much luck. I continually mix up the planets with the zodiac signs–I think I need to print my chart off and annotate it, but if you want to do the math for me, I’d love it. If Erin’s chart is handy, then her math too? I LOVE this blog; I feel like I’m taking an online class–a good one. Thank you. 5.31.72 @ 9:31 PM is me, btw. Hi, Nicole. I’m going to send you another copy of your chart which includes all the symbols and their names. I think this will help a lot. Out of 15 possible points, you have 6 in Air, 4 in Earth, 3 in Fire, and 2 in Water. Certainly an intellectual type, but balanced by good old Earth, the ability to actually get things done! Erin (I’m assuming she’s OK with me sharing with you) has 5 in Earth, 4 in Fire, 3 in Air, and 3 in Water. Very balanced. Strength in all areas. Got your email, thank you. I’m not so happy that Erin wins the balanced contest , but thank goodness she can teach me a bit. Hope you have a great week, Ellen — nourishing and rejuvenating.